Tony Timberline is our sire of the 2010 kids. We like using the Alpine bucks on our large Saanen does. It is a cross that has done very well for us. The Alpine is a larger and more rangy goat. Our wethers should stand from 34 to 40 inches at the shoulder and should weigh around 200 pounds. Excited for 2011?? We are at Summit Pack Goat. Our recently aquired buck brings more huge bloodlines back to the top of our program. Details to come!! The Alpine is a breed of goat that originated in the Alps. 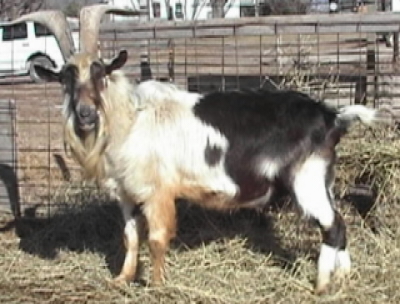 The goats of Alpine type that were brought to the United States from France had been selected for much greater size and production than the goats that were taken from Switzerland to France. The Alpine is a larger and more rangy goat. Mature females should stand not less than 30 inches at the withers and should weigh not less than 135 pounds. Males should stand from 34 to 40 inches at the withers and should weigh not less than 170 pounds. Buckly was retired as herd sire, he's now a packer and has proved to enjoy the trail life. 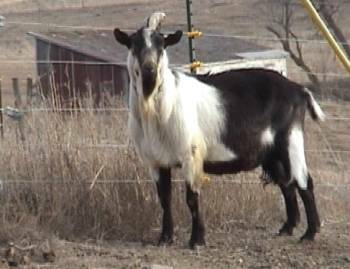 Yukon was purchased from Rex and Terri Summerfield of Northwest Pack Goats in the fall of 2001 to be used primarily as an outcross on our large Saanen and Saanen/Alpine does produced by Beau. Yukon's reputation as an outstanding producer of packers reached even our 'neck of the woods', sort to speak. He is a beautifully marked buck, ideal in breed standards, with the most docile disposition. He is producing kids maturing into outstanding packers. His offspring are exceeding him in height, averaging " in height at the wither, weighing in at lbs. in weight and packing loads virtually all over the United States. We feel crossing Yukon with our tall, large bodied Saanen and Saanen/Alpine does will produce for us some amazing packers. 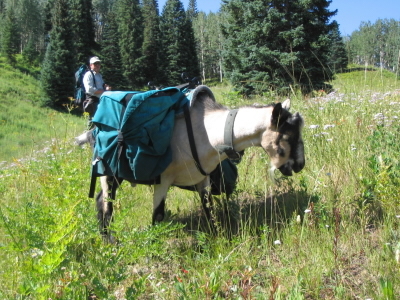 They may very well revolutionize the standards of your 'above average' packgoat.